Documents and all files related to them (embedded files, plot files, etc.) are automatically bundled together. You only need a single file bearing the extension .sci to share a document. You can seamlessly import TEX files created with earlier versions of the program, and you can export any document as a TEX file. In XML and XHTML files, Version 6represents your mathematics as MathML. This makes it easy to create XHTML web files for the representation of your mathematics on various platforms over the Internet with a browser. Note that the browser recommended for Version 6 is Firefox, not Scientific Viewer. Use pdfLATEX and XƎTEX to create documents with a wide variety of scalable fonts. With XƎTEX you can use any OpenType font installed on your computer, as well as Unicode and associated extended Unicode TrueType fonts. The program includes the latest version of LATEX and AMS; macros. The packages yield ligatures and kerning in all text when documents are typeset. REVTEX is a package of LATEX macros designed for preparing physics manuscripts. 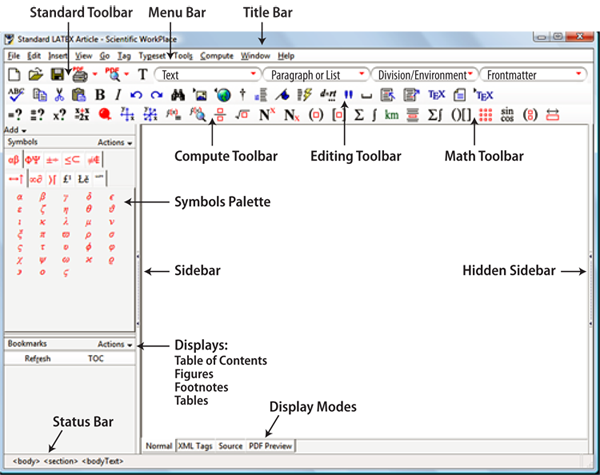 The software includes a shell with typesetting specifications for producing typeset documents for several different publications. Scientific WorkPlace Version 6 makes writing, sharing and typesetting mathematical and scientific text easier than you ever imagined. This is an easy-to-use word processor that integrates mathematics and text in the same environment. The embeddedMuPAD 5® computer algebra engine in Scientific WorkPlace 6allows the user to perform computations on the screen, and to print them out correctly formatted. With Version 6 you have a choice of operating systems:Windows® or OS X®. With its entirely new Mozilla-based architecture, Version 6 provides more flexibility; you can save or export your documents in multiple formats according to your publication and portability needs. Scientific WorkPlace 6 continues to be a front-end for the LATEX typesetting program which is used to typeset complex technical documents. 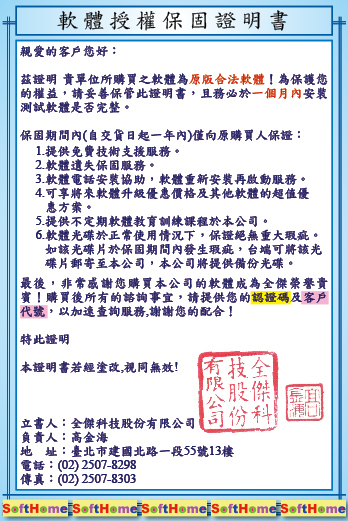 This means that you don㦙 have to learn the LATEX syntax. Because of its superior precision and quality, LATEX is the gold standard for publishers and authors of scientific papers and books. 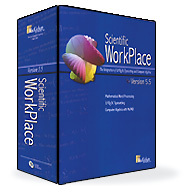 Scientific WorkPlace 6 has an updated program window with streamlined layouts for the toolbars and symbol panels. Most tools work the same way they did in earlier versions. 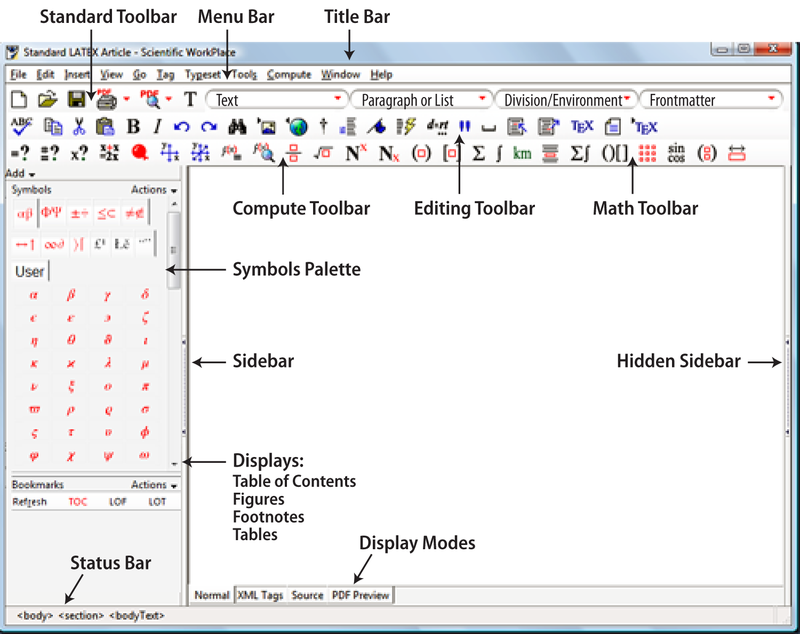 A mouse-activated tooltip gives the name of each toolbar button and panel symbols. 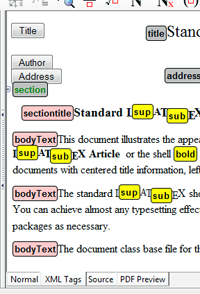 WithVersion 6 you can display your document with or without XML tags, as XHTML source code, orPDF. Documents and all files related to them (embedded files, plot files, etc.) are automatically bundled together. In Scientific WorkPlace 6 you only need a single file bearing the extension.sci to share a document. 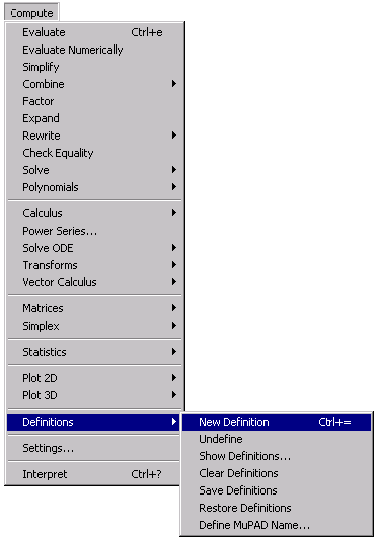 In XML and XHTML files, Version 6 represents your mathematics as MathML. This makes it easy to create XHTML web files for the representation of your mathematics on various platforms over the Internet with a browser. The recommended browser for Version 6 is Firefox, notScientific Viewer. Scientific WorkPlace 6 gives you multiple document production options. You can choose whether to preview or print directly from the program window when you are ready for output, or you can view your document in a browser. With Scientific WorkPlace you can typeset your document when you need the extensive document formatting that LATEX and pdfLATEXprovide. Also new is the ability to check your spelling in realtime. With the inline spell checking fromMySpell, you can catch any misspellings. MySpell, which is open-source, includes dictionaries in over 40 languages. Misspelled words have a wavy red underline. Scientific WorkPlace 6 gives you improved and scalable fonts. Use pdfLATEXor XƎTEX to create documents with a wide variety of scalable fonts. With XƎTEX you can use any OpenType font installed on your computer, as well as Unicode and associated extended Unicode TrueType fonts. 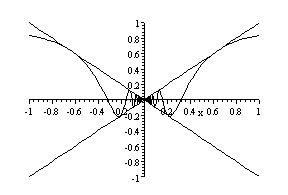 The program includes the latest version of LATEX and AℳS macros. The packages yield ligatures and kerning in all text when documents are typeset. Scientific WorkPlace 6 uses natural mathematical notation, so you don㦙 have to master complex syntax to be able to evaluate, simplify, solve, or plot mathematical expressions. Full computer algebra capabilities are available. You can compute symbolically or numerically, integrate, differentiate, and solve algebraic and differential equations. With menu commands you can compute with over 150 units of physical measure. With Scientific WorkPlace 6 you can create two- and three-dimensional plots in many styles and coordinate systems, and enhance the plots with background color, grid lines, and plot labels in specified locations and orientations. Although there are substantial changes toScientific WorkPlace 6, the computation behavior of the program is largely unchanged and will be familiar to previous users of our products. The manual, Doing Mathematics with Scientific WorkPlace and Scientific Notebook Version 6 by Darel W. Hardy and Carol L. Walker, describes the use of the underlying computer algebra system for doing mathematical calculations. In particular, it explains how to use the built-in computer algebra system to do a wide range of mathematics without dealing directly with MuPAD syntax. This manual is available as a download, but can also be purchasedin paperback. 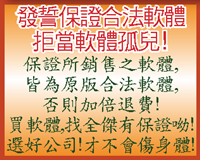 Chuan Hwa Book Co., Ltd.
National Chiao Tung University Graduate Institute of Technology and Innovation Management.